Life's too short to live in uncertainty, the stakes are too high. A month ago, I indicated the upcoming release of the third version of the script kiddies favorite Shark Malware. Despite that after the negative publicity of the malware that's actually promotd as a RAT, the authors supposedly abondoned the malware, they seem to have logically resumed its development. And so, the Shark3 malware is continuing its development. What's new? Anti-debugger capabilities in particural against - VmWare, Norman Sandbox, Sandboxie, VirtualPC, Symantec Sandbox, Virtual Box etc. "Earlier this week, the site for the Netherlands Embassy in Russia was caught serving a script that tried to dupe people into installing software that made their machines part of a botnet, according to Ofer Elzam, director of product management for eSafe, a business unit of Aladdin that blocks malicious web content from its customers' networks." Let's be a little more descriptive. The only IP that was included in the IFRAME was 68.178.194.64/tab.php which was then forwarding to 68.178.194.64/w/wtsin.cgi?s=z. ip-68-178-194-64.ip.secureserver.net (also responding to lmifsp.com and foxbayrental.com) has been down as of 22 Jan 2008 18:56:38 GMT, but apparantly it was also used in several other malware embedded attacks. For instance, the IFRAME is currently active at restorants.ru. The secondary IFRAME is a redirector script in a traffic management script that can load several different URLs, to both, generate fake visits to certain sites that are paying for this, and a live exploit URL as it happens in between. Historical preservation of actionable intelligence on who's what and what's when is a necessity. Here are for instance two far more in-depth assessments given the exploits URLs were still alive back then, discussing the malware embedded at the sites of the U.S Consulate in St. Petersburg, and the Syrian Embassy in the U.K.
"Is the first program of the Islamic multicast security across networks. It represents the highest level of technical multicast encrypted but far superior. All communications software, which are manufactured by major companies in the world so that integrates all services communications encrypted in the small-sized portable. Release I of the "secrets of the mujahideen" the bulletin brothers in the International Islamic Front and the media have registered so scoop qualitatively in the field of information and jihadist exploit the opportunity to thank them for their wonderful and distinctive. And the continuing support of a media jihadist group loyalty in the technical development of a network of Islamic loyalty program and the issuance of this version, in support of the mujahideen general and the Islamic State of Iraq in particular." "The efficacy of the new Arabic-language software to ensure secure e-mail and other communications could not be immediately gauged. But some security experts had warned that the wide distribution of its earlier version among Islamists and Arabic-speaking hackers could prove significant. Al Qaeda supporters widely use the Internet to spread the group's statements through hundreds of Islamist sites where anyone can post messages. Al Qaeda-linked groups also set up their own sites, which frequently have to move after being shut by Internet service providers." Needless to say that the new features, even the fact that they've updated the program has to be discussed from a strategic perspective. 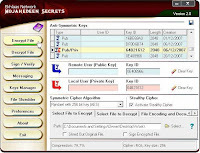 The improved GUI and the introduction of digital signing makes the program a handy tool for the desktop of the average cyber jihadist, average in respect to more advanced data hiding techniques, ones already discussed in previous issues of the Technical Mujahid E-zine. With the tempting feature to embedd the encrypted message on a web page instead of sending it, a possibility that's always been there namely to use the Dark Web for secure communication tool is getting closer to reality. Knowing that trying to directly break the encryption is impractical, coming up with pragmatic ways to obtain the passphrase is what government funded malware coders are trying to figure out. Screenshots courtesy of the tool's tutorial. The myth of someone reinventing the wheel, namely coding a malware bot from scratch is no longer realistic. Modern malware is open source, modular, localized to different languages, comes with extensive documentation/comments and HOWTO guides/videos. Moreover, these publicly obtainable open source malware bots were released in the wild for free, namely, the coders that originally started the "generators" or the "compilers" generation took, and enjoyed only the fame that came with coming up with the most widely used and successful bot family. Take Pinch for instance and the recent arrest of the "coders". New and improved versions of Pinch are making their rounds online, but how is this possible since the people behind it are no longer able to update it? To achieve immortality for Pinch, they've released it as open source tool, namely anyone can use its successful foundation for any other upcoming innovation. The original coders are gone, the "malware generators" and the "compilers" are cheering since they still have access to the tool. 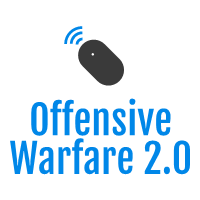 Another popular entry obstacle such as advanced coding skills is gone, anyone can compile, generate and spread the samples, or used them for targeted attacks. "I don't see in this a big tragedy," said a respondent who used the name Lightwatch. "Western countries played not the smallest role in the fall of the Soviet Union. But the Russians have a very amusing feature — they are able to get up from their knees, under any conditions or under any circumstances. As for the West? "You are getting what you deserve." It's a type of "Why are you doing me a favour that I still cannnot appreciate?" issue, collectivism vs individualistic societies. E-crime is not just easy to outsource, but the entry barriers in space are so low, we can easily argue it's no longer about the lack of capabilities, but the lack of motivation to participate, and actually survive, that drive E-crime particularly in respect to malware. From an economic perspective, the Underground Economy's high liquidity is perhaps the most logical incentive to participate, which is a clear indication on the transparency and communication that parties involved have managed to achieve. This tool deserves our attention mostly because of its do-it-yourself (DIY) nature, just like the many other related ones I discussed before. Custom error messages, two options for to kill or restore MSN after the password is obtained, and custom FTP settings to upload the accounting data. Why did they choose FTP compared to email as the leak point for the data? From my perspective uploading the accounting data on an FTP server means compatibility from the perspective of easily obtaining the accounting data to be used as foundation for another MSN spreading malware or spim, compared to accessing it from an email account. A sample is detected as W32/VB-Remote-TClient-based!Maximus. "Within the IM category, 19 percent of threats were reported on the AOL Instant Messenger network, 45 percent on MSN Messenger, 20 percent on Yahoo! Instant Messenger and 15 percent on all other IM networks including Jabber-based IM private networks. Attacks on these private networks have more than doubled in share since 2003, rising from seven percent of all IM attacks to 15 percent in 2007." As always, it's a matter of a vendor's sensors network to come up with increasing or decreasing levels of a particular threat, but the pragmatic reality nowadays has to do with less IM spreading malware, and much, much more malware embedded trusted web sites. Moreover, according to some publicly obtainable stats, IM spreading malware in general has been declining for the past two years, but how come? It's because of their broken and bit outdated social engineering model, namely the lack of messages localization, abuse of public events as windows of opportunities, and the lack of any kind of segmentation. One-to-many may be logical from an efficiency point of view, but it's like embedding a single exploit on hundreds of thousands of sites compared to a set of exploits, or a set of techniques like in this case. 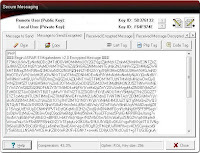 The Riders on the Storm Worm started riding on yet another short term window of opportunity as always - St. Valentine's day with a mass mailing email campaign linking to two files with_love.exe and withlove.exe, using an already infected host as a propagation vector itself in the very same fashion they've been doing so far. Surprisingly, there are no client-side vulnerabilities used in last two campaigns. "The random js attack is performed by dynamic embedding of scripts into a webpage. It provides a random filename that can only be accessed once. This dynamic embedding is done in such a selective manner that when a user has received a page with the embedded malicious script once, it will not be referenced again on further requests. This method prevents detection of the malware in later forensic analyses." Did anti virus vendors come up with a detection pattern for the .js already? Partly. And now that we've witnessed the execution of such an advanced and random attack approach limiting the possibilities for assessing the impact of a malware embedded attack the way it was done so far, we can only speculate on what's to come by the end of the first quarter of 2008. From my perspective however, the smartest thing in this type of attack technique is that they limit the leads they leave behind to the minimum, thus, forwarding the responsibility to the infected host and limiting the possibility for easy expanding of the rest of their ecosystem. Moreover, despite that the module or the actual kit if it's really a kit is a Proprietary Malware Tool for the time being, it will sooner or later leak out, and turn into a commodity, just like MPack and IcePack are these days. Furthermore, 203.117.111.106 seems to have made an appearance at otrix.ru, where in between the obfuscation an IFRAME loads to 58.65.233.97/forum.php, where two more get loaded 4qobj63z.tarog.us/tds/in.cgi?14; 4qobj63z.tarog.us/tds/in.cgi?15. 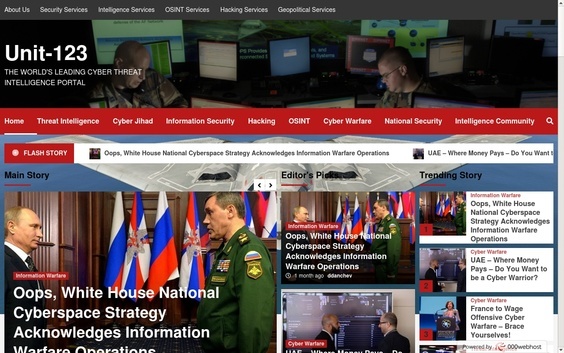 Deja vu, again, again and again - 4qobj63z.tarog.us was among the domains used in the malware embedded attack again the French government's site related to Lybia, and there I made the connection with the New Media Malware Gang for yet another time. There's indeed a connection between the RBN, Storm Worm and the The New Media malware gang. The malware gang is either a customer of the RBN, partners with the RBN sharing know-how in exchange for infrastructure on behalf of the RBN, or RBN's actual operational department. Piece by piece and an ugly puzzle picture appears thanks to everyone monitoring the RBN that is still 100% operational. What happened with the recent RealPlayer massive embedded malware attack? Two of the main hosts are now, and the third one ucmal.com/0.js is strangely loading an iframe to ISC's blog in between the following 61.188.39.218/pingback.txt which was returning the following message during the last couple of hours "You're welcome for being saved from near infection". As I'm sure others too like to analyze post incident response behavior of the malicious parties, in respect to this particular attack, during the weekend they took advantage of what's now a patent of the Russian Business Network, namely to serve a fake 404 error message but continue the campaign. However, in RBN's case, only the indexes were serving the fake account suspended messages, but the campaign was still active on the rest of the internal pages. In the RealPlayer's campaign case, the 404 error messages themselves were embedded with the same IFRAMEs as well, in order to make it look like there's an error, at least in front of the eyes of the average Internet user. Despite that the main campaign domains are blocked on a worldwide scale, the hundreds of thousands of sites that originally participated are still not clean and continue trying to load the now down domains. Moreover, the big picture has to do with a fourth domain as well, yl18.net/0.js, that used to be a part of the same type of massive malware embedded attack in November, 2007. Why pseudo "real players" anyway? Because for this attack, they took advantage of what can be defined as a fad, namely the use seperate exploit as the cornerstone of the campaign, at least if its massive infection they wanted to achieve. The "real players" or script kiddies on the majority of occasions, serve exploits on a client-side matching basis, and therefore the more diverse the exploits set, the higher the probability a vulnerable application will be detected and exploited. Therefore, given the number of sites affected it could have been much worse than it is currently based on speculations of the success rate of the campaign in terms of infections, not the sites affected - a success by itself. Execution gone wrong given the foundation for the attack - until the next time. The combination of the recent RealPlayer exploit and MDAC is a fad, but the very same is getting embraced in the short-term by malicious parties in China that have also started combining the Internet Explorer VML Download and Execute Exploit (MS07-004), thanks to recent localized forum postings on modifying the third exploit. Let's assess several sample domains. The binary is using a default set of known executables of anti malware products, and is installing a default debugger injected upon execution of any of these, and is therefore successfully killing many of the applications. The more complicated and dynamic these IFRAME-ing attacks get, the higher the campaign's lifecycle becomes, making it harder the determine where's the weakest link, and making it easier for the malicious parties to evaluate which node needs a boost by including new domains spread across different netblocks like this case. Count this as a historical example of a blackhat SEO campaign, and despite that "Fresh Afield's" blog (blogs.mdc.mo.gov) is now clean, cached copies confirm the existence of hidden links that were embedded on each and every post on it, apparently due to a compromise. The blackhat SEO links invisible embedded within the blog's posts on the other hand point to a compromised account at the Texas A&M University (aero.tamu.edu/people/raktim), as you can see in the screenshot. Moreover, there's also a visible part of the campaign that was located under blogs.mdc.mo.gov/custom/?0f, and as usual, once the blackhat SEO pages were either uploaded or embedded like it happened in this case, the campaigns under the blogs.mdc.mo.gov URL were spammed across the Internet. "Hackers for the first time are targeting the popular social networking site Facebook with a phishing scam that harvests users' login details and passwords. Some Facebook users checking their accounts Wednesday found odd postings of messages on their "wall" from one of their friends, saying: "lol i can't believe these pics got posted.... it's going to be BADDDD when her boyfriend sees these," followed by what looks like a genuine Facebook link. But the link leads to a fake Facebook login page hosted on a Chinese .cn domain. The fake page actually logs the victims into Facebook, but also keeps a copy of their user names and passwords." "One of our readers noted that there are a number of state government and educational sites that appear to have been compromised with the uc8010 domain. Upon review, I see that some of these have already been cleaned up. However, the .gov and .edu sites are only a few of the many many sites that are turned up via google searches for the uc8010 domain. As that domain was only registered as of Dec 28th, compromises of websites probably occurred in the past week." "Part of security software vendor CA's Web site was hacked earlier this week and was redirecting visitors to a malicious Web site hosted in China. Although the problem now appears to have been corrected, cached versions of some pages in the press section of CA.com show that earlier this week the site had been redirecting visitors to the uc8010.com domain, which has been serving malicious software since late December, according to Marcus Sachs, director of the SANS Internet Storm Center." 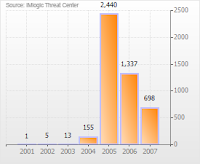 Compared to each and every malware embedded attack that I assessed in 2007, including all of Storm Worm's campaigns, they were all relying on outdated vulnerabilities to achieve their success, but this one is taking advantage of the now old-fashioned window of opportunity courtesy of a malicious party enjoying the given the lack of a patch for the vulnerability. Why old-fashioned? Because malware exploitation kits like MPack, IcePack, WebAttacker, the Nuclear Malware Kit and Zunker, changed the threatscape by achieving a 100% success rate through first identifying the victim's browser, than serving the exact exploit. Another such one-vulnerability-serving malware embedded attack was the MDAC exploits farm spread across different networks I covered in a previous post. It's also interesting to note that a MDAC live exploit page was also found within what was originally thought to be a RealPlayer exploit serving campaign only. Shall we play the devil's advocate? The campaign would have been far more successful if a malware exploitation kit was used, as by using a single exploit only, the campaign's success entirely relies on the eventual presence of RealPlayer on the infected machine.